SNS is looking for persons and businesses interested in distributing cloths, shirts -- and, in the near future, other products -- made by the graduates of SNS training workshops. At this time, SNS is accepting orders for small batches of hand-made batik and tie-dye shirts. SNS maintains a permanent address and a bank account in Accra, Ghana. Working directly with individual artisans in Ghana, SNS assumes responsibility for delivering the orders to distributors in Ghana and around the world. Due to limited funding, SNS is not in a position to send out free samples. However, SNS can ship small quantities of shirts at significantly discounted bulk prices, provided that the buyer pays for the shirts and shipping up front. To qualify for bulk pricing, you would need to order at least five shirts. For more information about the shirts or to request bulk shipments, please contact Margaret Amamu. 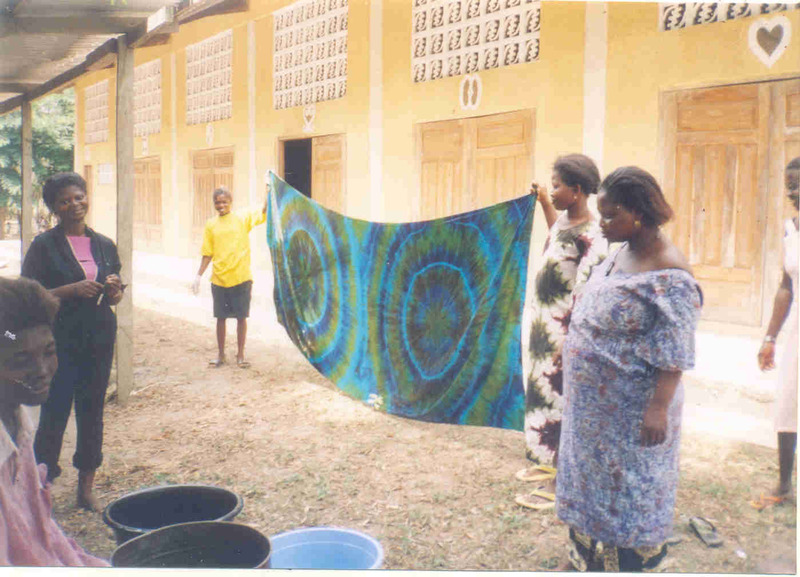 Photo on this page: SNS Ghana trainees admiring their own handy work, a very beautiful batik cloth.